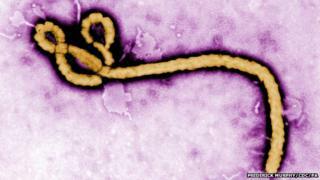 A 15-minute blood and saliva test for Ebola is to be trialled in Guinea, it has been announced. The solar-powered, portable laboratory should deliver results six times faster than tests currently used in West Africa. The researchers involved say faster diagnosis would increase the chances of survival and reduce transmission of the virus. The trial will take place at an Ebola treatment centre in Conakry, Guinea. Ebola is currently diagnosed by hunting for the virus's genetic material in the blood of a patient. But it requires dedicated laboratories that can keep the components of the test at very low temperatures. Patients in Conakry will still have the proven test, but the new faster method will be trialled at the same time so the results can be compared. The project, led by the Pasteur Institute in Dakar, Senegal, uses a 'mobile suitcase laboratory'. It is portable, solar-powered and can be used at room temperature. The project is being funded by the Wellcome Trust medical charity and the UK's Department for International Development. Dr Val Snewin, the international activities manager at the Wellcome Trust, said: "A reliable, 15-minute test that can confirm cases of Ebola would be a key tool for effective management of the Ebola outbreak - allowing patients to be identified, isolated and cared for as soon as possible. "It not only gives patients a better chance of survival, but it prevents transmission of the virus to other people. "This pilot study is particularly promising because researchers have considered how to make the test suitable for use in remote field hospitals, where resources - such as electricity and cold storage - are often in short supply." The UK's International Development Secretary Justine Greening said: "The UK is doing everything possible to help the government of Sierra Leone tackle and ultimately defeat Ebola. "Funding this groundbreaking research will develop new ways of diagnosing suspected cases even more quickly and stop more people suffering from this deadly virus."